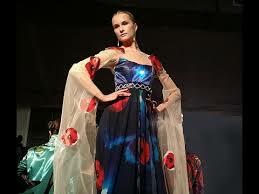 Online magazine Digital Output has an in-depth article reviewing the Epson Digital Couture event (Also covered here). In February, Digital Output was invited to attend the inaugural Epson Digital Couture event held during New York Fashion Week in New York City, NY. 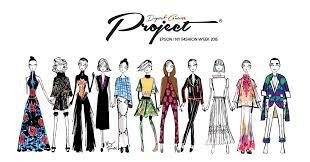 The company, through a collaboration with a fashion agency that regularly represents designers who participate in Fashion Week, introduced its SureColor F-Series dye-sublimation (dye-sub) technology to 11 designers. These creatives were asked to provide collections based on a theme—the future of fashion—which were then showcased during the Digital Couture fashion presentation. The result, a kaleidoscope of colors and patterns made possible thanks to digital dye-sub. 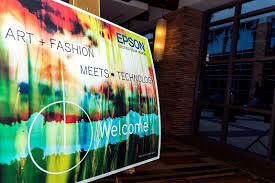 Epson worked remotely with the designers—three of which were located in the U.S. out of CA, FL, and NY—leading up the event to create the textiles used in their collections. According to Catalina Frank, product manager, professional imaging, Epson, the logistics of coordinating with the designers was one of the more challenging parts of the experience. Epson, a Long Beach, CA-based company, asked the designers to submit sketches of their work to be reviewed prior to the print process. There was a learning curve, notes Frank. The majority of the designers weren’t familiar with digital dye-sub and they submitted designs that utilized solid color. Many times, the Epson team presented the designers with feedback on best use of the technology, educating them about the possibilities of creating their own textures and patterns.